What was the Stonehenge and what was it used for? Archaeologists have found that the original Stonehenge was agraveyard for a community of elite families built around 500 years earlier than the site we know today. The team analysed the ancient remains of 63 bodies buried around Stonehenge, finding that the first monument was originally a graveyard for a community of elite families, whose remains were brought to Stonehenge and buried over a period of more than 200 years. 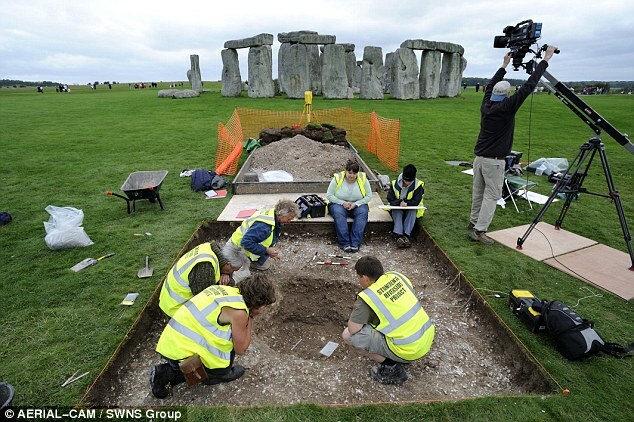 As Tim Darvill says: "Our new date for Stonehenge actually gives us, if you like, a glimpse of the moment in prehistory when things are happening at and around Stonehenge, and it's quite extraordinary that the date of the Amesbury Archer is identical with our new date for the bluestones at Stonehenge." This is proof that people believed that the bluestones had healing properties. Archaeologists (Tim Darvill & Geoffrey Wainwright) believe that the Amesbury Archer went to Stonehenge for the healing bluestones because he was suffering from an 'excruciatingly painful' knee injury. "This is a man who was not awfully well when he got to this part of Southern England. This is a man who was probably motivated in his travels to find some relief, to find some way of getting better." Tim Darvill. A stone (gneiss) mace head and bone pins found associated with cremated human remains in the Aubrey Holes at Stonehenge, evidence that very early in its development Stonehenge was a cemetery. Stonehenge is an ancient Neolithic monument that historians and archaeologists know little about. It is one of the wonders of the world. Archaeologist Mike Parker Pearson (who thinks Stonehenge was used as a burial ground) and archaeologists Timothy Darvill & Geoffrey Wainwright (who think it was a place for healing) disagree on the use of Stonehenge.